Ideal for small tubing demand applications or evaluating a specific dialysis membrane, the Trial Kit provides 1 meter of tubing with a pair of tubing closures and 5 opening picks. As the pioneer and leader in laboratory dialysis products, Spectrum offers the largest selection of dialysis membranes to meet the ever increasing and varied demands of the laboratory researcher. Keeping in mind MWCO, volume size, chemical compatibility, temperature, pH and solvent conditions, Spectrum has developed 2 fundamental grades of dialysis membranes, Spectra/Por® Standard Membrane and Spectra/Por Biotech Membrane, as well as 2 types of membranes, Regenerated Cellulose (RC) and Cellulose Ester (CE). Depending on the membrane grade and type, Spectrum offers the largest assortment of membrane configurations: tubing, Ready-to-Use Dialysis Devices (RDD) and flat-sheet. Being the most conventional configuration, rolled dialysis tubing is available dry, pre-wetted or pre-treated. Offering the ultimate in convenience, dialysis tubing is also available pre-assembled into 3 types of (RDD): Float-A-Lyzer® G2, Tube-A-Lyzer® and Dialysis Sacks. Flat-sheet membranes are available in sheets and discs for use with various types of dialysis apparatuses and systems also available from Spectrum. T-Pro EZ Gel Solution is "ready-to-run" SDS polyacrylamide solutions polymerize into an advanced molecular sieve for the electrophoretic separation of proteins. Because of the advanced buffer chemistry used in the gel matrix solution, T-Pro EZ Gels allow a single separating gel. No stacking gel is required, as the T-Pro EZ Gel Solution proprietary formulation inherently stacks the protein samples during the normal electrophoresis run. Band resolution is unparalleled over a molecular range of 2.5 to 250 kDa. The new hybrid formulation of T-Pro EZ Gel Solution gives these gels an increased gel strength, which allows for easier handling. T-Pro EZ Gel Solution will work with all types of universal electrophoresis apparatus. Our gel mixtures are formulated for optimal performance in mass spectrometry-based proteomics experiments. High gel strength - allows easier handling. 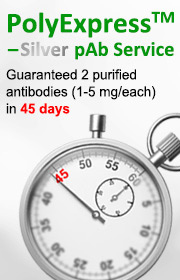 Ready to use in less than 10-15 minutes - just add TEMED and APS to polymerize the gel. High resolution gels for protein separation across a broad molecular weight range. Description: JC-1 is a mitochondrial dye that stains mitochondria in living cells in a membrane potential-dependent fashion. JC-1 monomer is in equilibrium with so called J-aggregates, which are favored at higher mitochondrial membrane potential. The monomer JC-1 has green fluorescence (lem = 527 nm), while the J-aggregates have red fluorescence (lem = 590 nm). Therefore, it has been possible to use fluorescence ratioing technique to study mitochondrial membrane potential. JC-1 is particularly useful for apoptosis studies. In apoptotic cells, the dye stays in the cytoplasm and fluoresces green, while in healthy cells, the dye aggregates in the mitochondria and fluoresces red. GenScript Express PAGE Gels are high-performance precast mini polyacrylamide gels for protein electrophoresis that exhibit long shelf life, fast run time and efficient transfer. Express Gels are cast in a neutral pH buffer that minimizes the hydrolysis of polyacrylamide and results in extra gel stability and superior band resolution. Manufactured without SDS, Express PAGE Gels are ideal for SDS-PAGE and native electrophoresis depending on the running buffer and transfer buffer used. The proprietary gel-casting techniques provide excellent batch-to-batch reproducibility and guarantee the reliable migration pattern. 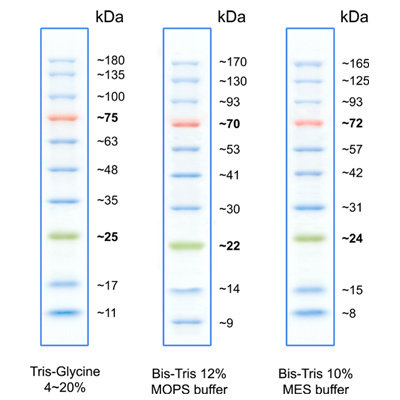 Using specially formulated Tris-MOPS running buffer, Express Gels enable proteins to be separated quickly and easily for subsequent detection by staining or Western blotting. Easy to use: simple to set up, no comb or tapes to be removed. High Resolution: proprietary gel casting technique for high-resolution separation of protein bands. High reproducibility: consistent performance from gel to gel. Long Shelf Life: up to 12 months at 4°C. Compatible cassette design: fit most of popular mini-gel tanks. Xenopus, Drosophila, Kangaroo rat, and Chylamydomonas. loading control for quantitive western blotting. contact a technical service representative for more information. 50kDa band in a Western Blot analysis. dilutions/concentrations should be determined by the end use. (er) BMC Mol. Biol. 8, 55 (2007). recognizes a 37kDa band in a Western Blot analysis. Recognize β-actin from Human and Mouse. Blot: 1:500 â€“ 1:1,000. IP: 5 mcg/mg lysate. a mouse monoclonal antibody, affinity purified from mouse ascites fluid. determine optimal working dilution by titration test. S-phase cells may provide an estimate for the fraction of cells in S-phase. proliferation, the cytokinetics of normal and neoplastic cells, etc. µg (0.5 mg/ml) in 10% glycerol in PBS. & Usage: The antibody can be used in IHC, IP, ICC, ELISA, IF, FACS. However, the optimal concentrations should be determined individually. containing the His epitope (H-H-H-H-H-H). carboxy- terminus of targeted proteins in transfected mammalian cells. TBS, 50% glycerol, pH 7.4 with 0.01% sodium azide. Beta-Actin is highly conserved with Gamma-Actin. Recognize β-actin from Human and Mouse. Other species not tested yet. comb or tapes to be removed. casting technique for high-resolution separation of protein bands. most of popular mini-gel tanks. prepare buffers according to our protocol.